What if the fae were still here, living among us? Perhaps living in secret, doing their best to pass for human? Or perhaps their existence is acknowledged, but they're still struggling to fit in. How have they survived? Are they outcasts clinging to the edges of society, or do their powers ensure success in the mortal realm? Here are fourteen fabulous tales—ranging from humor to dark fantasy—that explore how the creatures of fae are fitting into the modern world. From a mortal who offers to do internet marketing for Oberon...to a woman bent on reclaiming her baby from the Queen of the fae...to a dryad grove menaced by urban expansion...to a Selkie in need of a new home and career...these are original looks at how the world of the imagination can survive and perhaps even thrive in the everyday mortal lands. Joshua Palmatier was born in PA, but now resides in NY. Palmatier started writing SF and Fantasy novels and short stories in eighth grade, and hasn't stopped writing since, mainly focusing on novels. He can be found at sff.net/people/jpalmatier/. 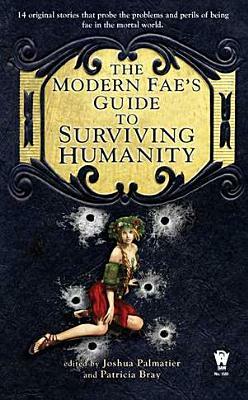 "A wonderful anthology of quirky, sometimes scary and often funny tales about how the fae are getting by in the modern world. Whether a transgendered werewolf living in the East Village in New York City or the Unseelie Court running a chain of discount department stores (putting a glamour on their "greeters" so they can get through a shift without killing anyone), they're doing their best to blend but not always with the greatest of success." "This is a great book to have if you spend time in a carpool line, or waiting at a doctor’s office, or any time you have about 30 minutes to read. You will be entertained and maybe find a new author as well."